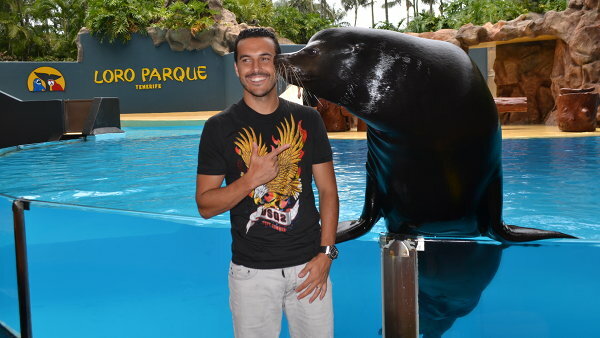 Loro Parque received the visit from Pedro Rodríguez Ledesma, footballer in Chelsea FC and the Spanish National Football Team, who is on holidays in his native land to enjoy a very special family day in the best zoo in Europe and the second in the world, according to TripAdvisor. During his visit, he could enjoy the majestic orcas in OrcaOcean, learn about the exhibitions with our Discovery Tour and enjoy the experience of Planet Penguin, recently renovated. He also had time to meet the lovely Red Panda couple and reunite with dolphins and sea lions, one of which is a “god-son” of Pedro. The famous forward, who was born in Abades –also in Tenerife– toured the park under the watchful eye of his fans, whom he greeted very warmly. Pedro has taken many pictures with all of those who wanted to capture this very special moment with their idol. At the end of the tour, he could enjoy a lunch at Brunelli’s Restaurant, with his family, an authentic steakhouse where they have tasted the select meats while enjoying the fascinating views of the Atlantic Ocean. Once again, Loro Parque becomes the stage chosen for the presentation of the 24 candidates for Miss Norte 2016, an event to be held on Saturday July 23 in the municipality of El Tanque. The presentation, which was held at the spectacular OrcaOcean stadium, was attended by El Tanque’s mayor, Román Martín; the organiser of Miss Norte, Sandro Pérgola; and the singer and godfather of the Red Pandas couple, Luis Deseda, who thanked the commitment of Loro Parque to “an event that has established itself as leader in beauty contests held in the Canary Islands”. The hopefuls enjoyed a different day in the #1 Zoo in Europe and the second in the world according to TripAdvisor, with its fascinating exhibition of orcas and the lovely couple of Red Pandas, that delighted the candidates during the route through the park. They also had the time to enjoy a cocktail at Brunelli’s restaurant, as well as to see firsthand the fantastic views to the Atlantic Ocean provided by this steakhouse located in Punta Brava. Miss Norte is an event that has now been held for more than 16 years in different locations of Tenerife. Its hallmark is to foster the beauty of the hopefuls while promoting the culture, landscapes and history of the northern towns that have hosted this contest. Another example of the importance and good reception of this contest is the ever-growing number of candidates in the 2016’s edition, reaching up to 24 hopefuls this year. 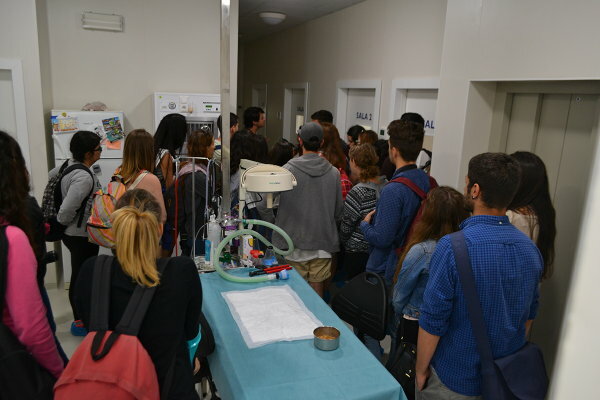 This Saturday, 21st of May, Loro Parque opened its door for 25 students who are in their first year of studying veterinary medicine at the University of Las Palmas de Gran Canary and came to Tenerife to get to know the daily work of our professional veterinaries that guarantee the health of all animals in Loro Parque. The visit was guided by Javier Almunia, the director of environmental affairs at Loro Parque Fundación. The students of veterinary medicine could visit the facilities of the best zoo in Europe and the 2nd best in world, according to TripAdvisor. At the same time they had the opportunity to talk to several authorities and caregivers that showed the students an insight of their work and answered their questions. The students also learned about the health care of cetaceans, thanks to an interesting presentation of the trainers themselves who taught the students about techniques of positive reinforcement and how they accomplish a voluntary attendance of the dolphins and orcas in their daily medical check-ups. Likewise the group visited the innovative technical rooms of the park where our filtrations plants warrant the best water quality for the animals, as well as the premises for feed preparation of individual feed quantity which is specific adjusted to the characteristics and needs of our animals. An accurate training and specific feeding reduces diseases and improves the well-being of animals. Planet Penguin, as one of the biggest penguin sanctuary worldwide, was also part of the visit of the prospective veterinaries. It’s an impressing facility that the students surprised with the various and curious kind of these smart animals which live in the exhibition of Loro Parque. During the whole day the students showed interest and enthusiasm, especially at Animal Embassy, one of the most emotional zones at Loro Parque and Loro Parque Fundación. In this special embassy they saw the baby-station for the hand-rearing of birds and the more than 130 projects of the foundation for the protection of biodiversity and natural habitations, spread over the whole world. Since the founding of the non-governmental organization in 1994 already more than 16 million US$ are invested in its conservation actions. 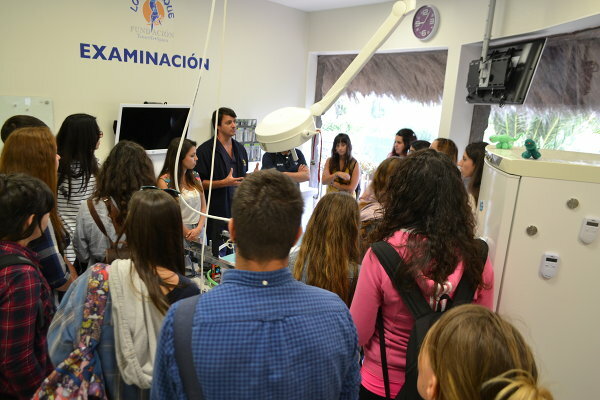 Loro Parque is delighted by the visit of the students and wishes all the best for their further studies of veterinary medicine. oro Parque represents a true window to the nature that allows each and every one of us learn from this great ambassador for nature and, at the same time, enjoy a beautiful day in the park. So, this past weekend we received a famous Spanish actor, Juan José Ballesta, who did not want to miss the chance to visit Loro Parque’s facilities with his family. Juan is presently in Tenerife, forming part of the acting crew of the newest movie “Oro”. 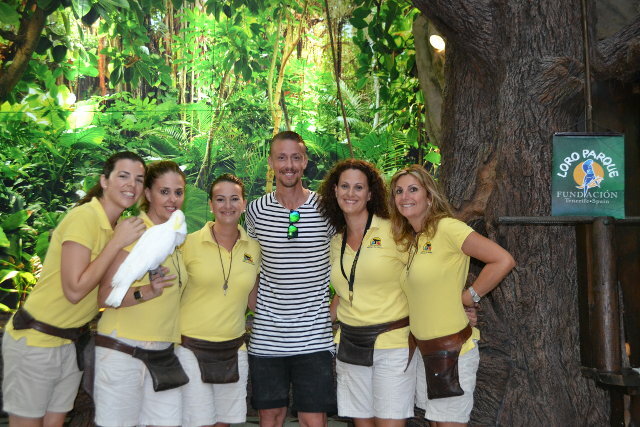 The actor has astonished us with his love and passion for nature, declaring himself a fan of Loro Parque. During his visit, he paid special attention to the efforts that both Loro Parque and Loro Parque Fundación carry out in research, conservation and education around the globe — this is what attracted him the most when he decided to visit us. Ballesta and his family acknowledged great importance of transmitting the educative message so that people could appreciate the true value and respect toward the biodiversity and the importance of carrying out the efforts in rescue, raising awareness and conducting investigation for the benefit of the conservation. We thank our guests for the visit, it has been a pleasure to share the passion, respect and care for the wonders of nature! 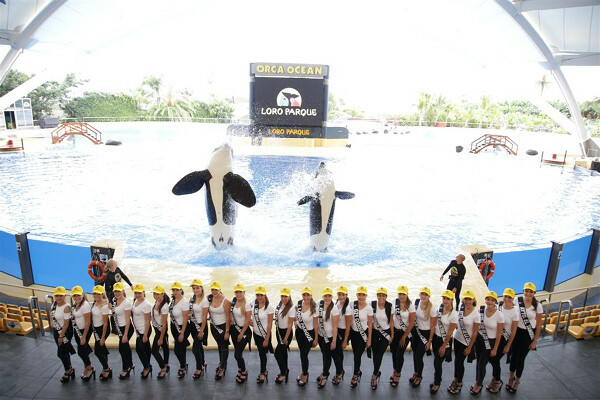 Loro Parque welcomes once again the world of beauty and elegance by receiving the visit of the contestants of Mrs. Europe. The European candidates recently visited the park accompanied by Thaís Arias, the official Spanish representative for international beauty pageants such as Mrs Universe and Mrs Europe. Thaís is also director and founder of the island competitions Mrs La Palma, Mrs Tenerife Islands, Mrs. Lanzarote and Mrs. Las Palmas. The visit took place just two days before the Gala where the winner of this international contest will be announced. During their visit, the 18 candidates enjoyed the excellent facilities of Loro Parque and took exciting photos at Katandra Treetops, Orquidario and other exhibitions. 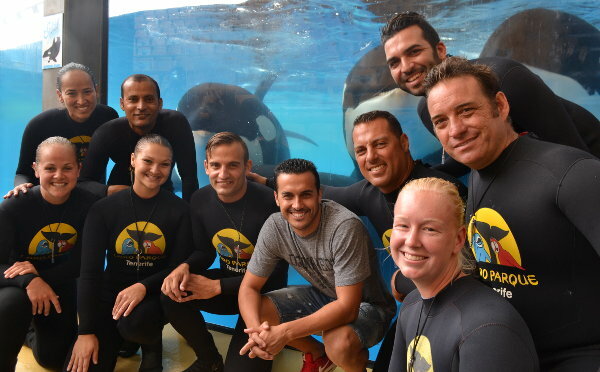 The contestants were especially impressed with OrcaOcean, where they enjoyed the magnificent show and took photos to remember this memorable visit. 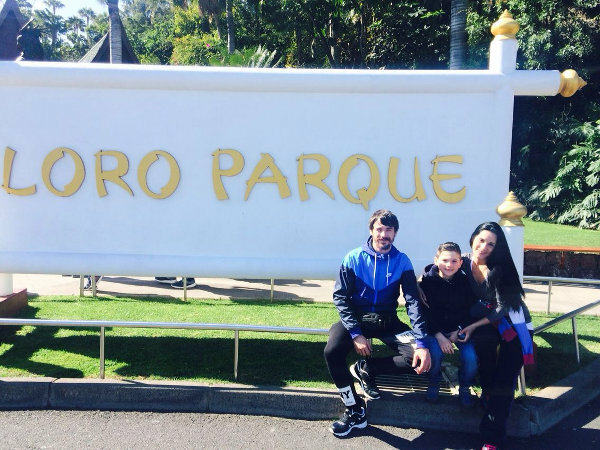 On Tuesday, August 11th, the winner of 2015 edition of a popular TV Show “La Voz Kids”, Maria Parrado, known for her strong, yet sensitive voice, visited Loro Parque together with her family. She took advantage of this fantastic opportunity to get to know the best zoological park in Europe and No. 2 in the world, according to Tripadvisor, during her vacation in the Canary Islands. The little star singer enjoyed the dolphin and whale shows and was able to see the spectacular installations of gorillas, alligators, penguins, and other animals. Loro Parque received the visit of the former Real Madrid player Guti and his girlfriend Romina Belluscio, Argentinean model and TV host. Along with their child, the couple enjoyed a day out at the Nº1 Zoo in Europe and 2º in the world, where they watched the spectacular orca presentation, Loro Show and other animals in the world-renowned zoo. The memorable 14 didn’t go unnoticed and took pictures with several fans that went up to greet him. Loro Parque and Siam Park welcomed Pedro Rodríguez Ledesma, Barcelona and Spanish national footballer player, who for years has been making the most of his holidays at home by visiting both leisure parks. On this occasion he was accompanied by his family and friends who also enjoyed the show at Orca Ocean, recently reopened. They also saw the dolphins and sea lions and didn’t miss the chance to watch the new 3D film Río. At Siam Park he enjoyed an exclusive villa and took advantage of the good weather to have fun with his kid at the Nº1 water park in the world. By late afternoon, and closely watched by his fans, he kindly greeted visitors who walked up to him to have their photo taken with their idol.